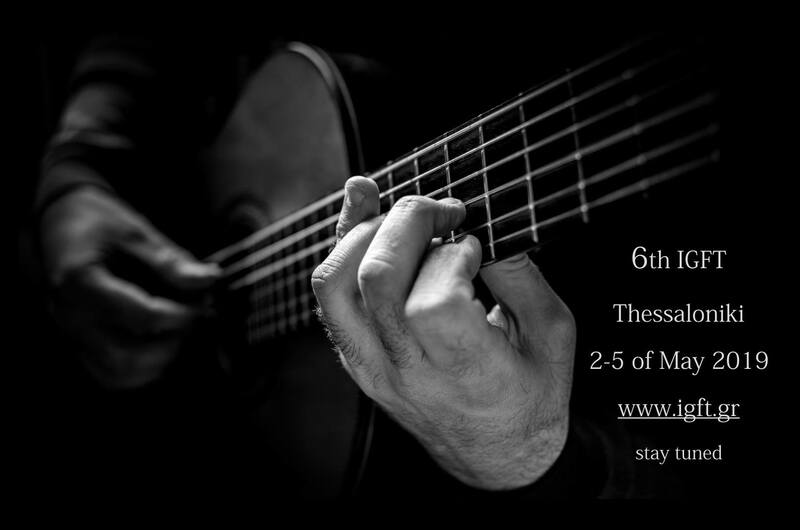 The Thessaloniki Conservatories Board of Alumni organizes during the 6th Guitar Festival in Thessaloniki the Competition of Composition for six-string guitar. The aim of that competition is to augment the modern repertory of the guitar. The competition of composition for the year 2019 requests one solo piece for classical guitar which not lasts less than four (4) minutes and no more than seven (7). The composition could be the motto of the competition. In that case, it could be used in all the activities of the 6th International Guitar Festival of Thessaloniki. The compositions which will be submitted, should not have been published or played in any other public concert, recital and should not have been reproduced or posted in social networks or other mass media before the ceremony of the festival. The compositions should be written for a six-string solo guitar. The competition is open to all composers regardless the nationality or the age. Every composer can participate with more than one pieces. As far as the participation is concerned the competitor shall send to the competition: a) 8 copies of the sheet music. These, should not contain any information or reference which could allow the identification of the writer. Each copy should have prominently the name of the piece and its duration. b) a recording of the piece ( 2 copies) with the selected name in English as a title, as a digital file or CD-ROM. This file must be sent with the sheet music. c) A closed envelop, with the same name as the sheet music, with the following form of application, properly completed and signed in the correct points with : a name, surname, clear address (phone number, fax, e-mail) signed declaration that the composition is not published and a phone number for any communication after the end of the festival. In any case, the date that is referred in the postal stamp will be considered as the date of the sending. The omission to observe the regulations which have been published above, may lead to the exclusion of the competitor from the festival. All the written material should be indicated with readable capital letters and in one of the formal languages of the contest (English, Greek). The registration fee for the contest is 30(thirty) Euro for the first play, whereas for the other opus which will be sent by the same composer the cost will be 20(twenty) Euro for each composition. (Every composer can send more than one composition in the contest). One international jury which consists of 5 (five) members at least whose names will be announced by the organizers, will be authorized to choose maximum 6 compositions for the award. The pieces which will be chosen, will be played by the guitarist and the Artistic Director of the International Guitar Festival of Thessaloniki Mr. Fotis Koutsothodoros at 3rd of April 2019. The winner will be announced at 5th of May 2019. The music piece which will win, will be awarded with 500 (five hundred) Euro. The first award cannot be divided. The winning composition will be published. The winning piece will be performed in the presence of the composer during the 6th Guitar Festival of Thessaloniki and is going to be attended by artists, teachers, contestants in the guitar and specialized magazines. If there are any other prizes apart from those listed, they will be awarded during the ceremony. The jury has the right not to accord or to accord the award. The decision of the jury is definite. The composers who wish to take back the copies of the composition that they have sent (one copy will stay in the records of the organizing committee) have to fully undertake the costs to send them. The application for participation in the contest, confirms that the contestants accept highly all the rules and regulations set at this present sheet. In case of any disagreement or difference of opinion on the regulations, the only valid text will be the present announcement written in Greek and completed with 8 (eight) paragraphs/sections (competent authority: the courts of Thessaloniki, Greece).